Interesting piece in the New York Times today about the possible discovery of the identity of the author of "The Bondwoman's Narrative" by Hannah Crafts -- an 1850s manuscript, bought at auction in 2002 by Henry Louis Gates, Jr., that seems to be a semi-autobiographical novel written by a slave who lived on and escaped from a North Carolina plantation. Because of the novel's initial reference to the plantation owner as "Wh__r" and a later reference to him as "Wheeler," people have connected the novel to plantation owned by John Wheeler, a North Carolina politician and sometime diarist (who wrote about seeing John Wilkes Booth playing Shylock, and described Booth as "promising."). The original work has been confirmed to have been written on paper manufactured in the 1850s, with a goose-quill pen. The person who exposed the Jack the Ripper diaries as a fraud has confirmed its authenticity. Professor Gregg Hecimovich of the University of North Carolina at Chapel Hill has now discovered some biographical details about a slavewoman named Hannah Bond (get it? The title of the work is "The Bondwoman's Narrative"), who lived and worked on the plantation, escaped from it disguised as a man, and at one point sheltered with a family named Crafts. The novel itself contains passages lifted from Dickens (Bleak House), Sir Walter Scott (Rob Roy), and other English authors. The Wheeler plantation housed a good collection of English literature, but it's not clear that it had Bleak House. For that, Professor H has discovered that girls from a nearby school who boarded at the plantation were required to memorize portions of Bleak House, and that this may be where Hannah got it. The hope now is to find something that Hannah Bond wrote and to match the handwriting. It's the sort of story that everybody -- including me -- wants to be true. Hilary Mantel (author of some great books that for some reason I haven't been able to struggle through) wrote a great review of it here, and some of the above comes from her review. In a temporary complete shift of subject (we bloggers can do that), I'll note a great quote from Mantel's review (in discussing the way Hannah's mistress mistreats Hannah, even though they have both been victimized by the same man): "the weak are cruel to those weaker than themselves." I love that quote because it's something one observes again and again in daily life, and it's also a scientific fact. I know this because Robert Sapolsky told me so in a Teaching Company lecture, in which he described giving extra testosterone to some kind of monkey or ape, in a group in which there was a defined dominance hierarchy. When you do that, that won't cause e.g. number 2 to rebel against no. 1. Instead, it just causes number 2 to become an even bigger jerk to number 3. So why am I writing about this? I guess it's because it reminds me so much of the whole Shakespeare Cobbe Portrait thing from a few years back. 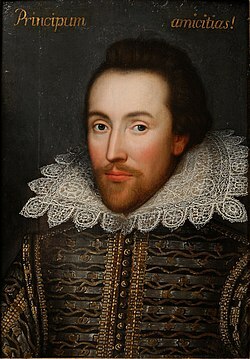 Although the only known contemporaneous portrait of Shakespeare has him looking somewhat toad-like, there is a persistent movement among certain Shakespeare scholars (including Stephen Greenblatt, of Will in the World fame, for one) to make him good-looking. After all, he was an actor, and doubtless therefore presented himself with a certain amount of grace. I don't know if the "Cobbe portrait controversy" has been resolved, but the fact is, the notion that the portrait on the right is Shakespeare is not something any reasonable person should say he is "convinced" of (as famous Shakespeare scholar Stanley Wells is on record as saying). It's now been established that the painting was painted around 1610 (based on the collar). 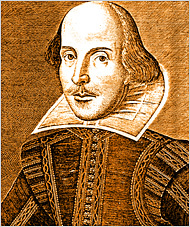 By then, Shakespeare was 46 years old, weather-beaten, bald, and possibly suffering from syphilis. I seriously doubt he looked like the one on the right. But I don't know, and that's the point -- there is no way to establish the truth one way or another, so the responsible way to deal with it is to remain skeptical, but open to either possibility. So what does this have to do with Hannah Bond? Only this -- there is one other possibility that nobody has mentioned, and which nobody wants to be true. The fact that Hannah Bond sheltered with a family named Crafts is certainly one more piece of evidence that the novel came from Hannah Bond the fugitive slave. But it can equally support another theory that fits the other known facts just as well -- that the novel itself was written by someone from the Crafts family. I have a feeling that nobody is going to try to track that down anytime soon, but if it turns out, e.g., that the Craft family included an educated woman with time on her hands, then perhaps we have another, somewhat less interesting, candidate for authorship of "The Bondwoman's Narrative." And the use of the name Hannah Crafts would make perfect sense -- the work itself was a combined effort between Hannah Bond and the unknown Crafts. "The novel, Professor Hecimovich believes, had its beginnings in the Wheeler home, where Bond could have had access to the family’s library and its writing materials, including a distinctive paper that was used to connect the novel to the Wheelers." The NYT piece doesn't follow up on this. I just tried to google "paper wheeler hannah crafts" and the only relevant hit that comes up is the NYT article (and the above quote); perhaps Gates says something about the paper in his published version of the book. And of course, some of the paper had to come from somewhere else, if our assumption is going to be that she named herself Hannah Crafts after the Crafts family, whom she only met after leaving the Wheeler plantation. The story apparently also recounts events that occurred after her escape from the Wheeler plantation, so it seems all the more odd to try to connect the paper itself to the Wheelers -- did she escape with a few hundred blank sheets of Wheeler paper? So under my alternative theory, the notion is simply that Hannah Bond escaped, and told her story to someone from the Crafts family, who essentially made a novel out of it. The only thing in the news stories that arguably works against my theory is the "coincidence'" that there's a lot of material in the work that appears to have been "lifted" from famous works of literature that happened to be in the Wheeler library. Of course, they were famous pieces of literature, so they could have been known to an educated person in the Crafts household as well. And I still don't completely understand the theory of how Hannah would have written the book -- did she write some of it while on the plantation, and then take it (plus a lot of extra paper) with her when she escaped, and then finished it as the rest of her life unfolded? Are the passages that are lifted from famous authors limited to events that occurred before she left the plantation, or do some of them appear after that? And is there material lifted from famous works that were not in the Wheeler collection? (it sounds like Bleak House is one example, which is why the gap had to be filled in by the boarding girls theory). One of the the points that is cited in favor of slave authorship is that people are described as humans before they are described as black or white. That apparently never happened in the fake slave novels written by white abolitionists of the day. But it's perfectly consistent with the idea that the Crafts woman got her information first-hand from a slave. Where does this leave us? Only here: If anyone cares, they should make an effort to disprove the possibility that someone in the Crafts family, with whom Hanna Bond took shelter, wrote the novel. See if one can find handwriting samples from that Crafts family, and if none of them match, then that helps Hannah Bond's case. But if one of them does, well, that would be interesting too. Update 092013 -- a little more googling and I found that there were skeptics back when the book was first introduced to the public in 2002. At the time, John Bloom made a decent case in the National Review that the narrative could well have been written by a white woman, and that the odds that a domestic servant on the Wheeler plantation would have been able to educate themselves to an 11th-grade level made the white-woman theory more plausible than the black-slave theory. Bloom made the additional point that it seems possible that the novel was only completed as the Civil War broke out, and that if that were the case, the reason for a white person pretending to be a black person to want to publish it would have vanished. As always, I hasten to add that I'd be happier than most if it turns out that the novel was written by a slave woman; I'm just here to make sure that all possible theories are considered and tested.